Our thighs create a frame around the horse. They can shape the movement and control the energy. They are in the correct position. The torso is stabilized with internal abdominal pressure. The rider can feel what is going on under his/her thighs and seatbones instead of focusing on the hands and horse's head. In the correct thigh position the thighs are rotated inward from the hip joint. Almost as much as when we are on the ground (see the picture on the left). When we sit in the saddle and relax our legs, they fall outward from the hips. Next time you ride, look down at your thighs, relax them completely and notice how they immediately rotate outwards even on a still horse. They rotate even more when the horse moves. To keep your thigh rotated in, you must engage your thigh muscles (See more about thigh muscles). If your adductors (inner thigh muscles) are tight, you may not be able to rotate your thighs in enough, especially on a wide horse. This happens because adductors do not only squeeze our legs together, but also rotate our legs outwards. When they are tight, they lock your thighs in an outward position and do not let them rotate inward. In this case, you need streching exercises off the horse so that you could begin to put your thighs in the correct position. It takes time and patience. When a thigh is rotated enough it lays flat. Both knee and toe point forward. Compare the pictures above, noticing the difference in the position of the hip, knee and ankle joints. The next step is to slightly engage muscles under your seat bones. Engaging these muscles will achieve quietness of the hips and pelvis in the saddle. You will only move as much as your horse and no more. You will get a feeling that you are glued to the saddle, and that there is no more swaying and slashing around. Try it on a hard chair. Sit on it with your back straight, be relaxed and make an attempt to move your chair back and forth with your legs (don't seat on a moveable chair). You will get a feeling that your seatbones are sliding back and forth on top of the muscles, while the muscles do not move against the chair. Then slightly tighten the muscles under your seatbones and try to move your chair. Feel the difference! The seatbones no longer move and you can almost take your chair with you. Do it in front of a mirror. Position yourself so you can see your legs from the side. Observe the difference. When my students first experience this feeling on a horse they say: "Oh! I'm connected to the saddle!" Another benefit that comes from engaging the muscles under your seatbones is that the firmness spreads to the outside of your thighs. The outside thigh muscles (abductors) lift your thighs away from the saddle. This helps you avoid gripping the horse with your knees while using your inner muscles to direct your horse. I have yet to see a person who rotates the thighs too much inside, however, you can overdo the firmness under your seatbones. Especially men, who, naturally, have more toned muscles. Familiar saying, isn't it. However, if you think only of your lower leg you are missing a big piece of a puzzle. You need to keep your horse between your entire legs, thighs too. Don't let your horse push his ribcage sideways and slide away from under you. Compare it with your horse being a river and your thighs being the banks. If the banks are not firm the water will spill sideways. The same thing happens with the horse. If your thighs are soft and floppy the horse will push through them and spill all the energy sideways. Regulate the horse's energy by creating an active barrier that directs him where you want him to go. If, for example, on a left turn, your horse is falling right use your right thigh and actively push your knee into him saying: "That direction is closed for you, move your body left." If, to turn your horse, you only pull on the left rein, he will use that rein to hang onto you and pull even more right. For me, this was the most difficult and most revolutionary idea that I have learned. That was the brakethrough that the Mary Wanless' book and video series helped me the most. It took me a while to understand the idea and then start applying it. The main muscle to engage is rectus femoris (front of the thigh). We can use our thighs to lift our horse's back, to slow him down, to half-halt him, to send his energy up, to do a flying change, to collect his trot or canter etc. Before you can control and direct your horse's energy you need to create it with your lower leg. I have found 2 different ways to explain the correct work of the thighs in easy terms. I often show this to my students by stabilizing their lower leg with my hands while they are in the saddle and asking them to think of unbending their knee without actually moving any part of the leg. Then, when my students ride, I ask them to become firm in the middle, rotate their thighs even more inward, engage muscles under seatbones and recreate the feeling of unbending their knees without moving the legs. When they are able to do all that at once, I ask them to close their fists without pulling backwards. Their horse slows down or even stops and they look at me with such a surprise and excitement in their eyes. Another way is to do that off the horse. Stand with our feet slightly apart and knees bent. Put your hands on the front of your thighs. Jump forward, not much, a couple feet, and upon lending stop your forward momentum instantly. Feel how your thigh muscles under your hands become firm. That is because they have stopped your forward progression. We need this kind of action of our thigh muscles in the saddle. You need to create a balance between the front and back of your thigh muscles. You need to slightly engage the back of your thigh too (hamstrings not buttocks). Using only front of your thighs will lift you up from the saddle. When you slightly firm muscles under your seatbones, spread that firmness down the back of your thigh. Think of slightly pressing your thigh down into the saddle. Do not confuse this with stepping into the stirrup, which will inevitably create an opposite effect. Also, hamstring muscles are responsible for bending the knees and applying lower leg aids. The bottom line is in order for the legs to be in the correct position many muscles in the legs need to be involved. 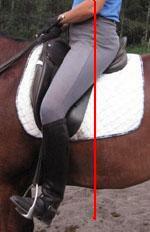 In order for the rider to stay balanced and be effective with the aiding the leg muscles must be supple. Suppleness means the ability of the muscle to engage and relax without becoming rigid or loose. Stiff/rigit muscles creat stiff joints and loose/weak muscles create unstable joints. When you succeed in stabilizing and balancing front and back of your thighs you will get a feeling that your horse hangs from your seat and totally at your will. When you understand these concepts, this will only be a beginning of your exploration of all the nuances and intricacies, all the situations and possibilities in riding. From my own experience, I must tell you my riding has never been so exciting as it is now! I feel incredible reverence to Mary Wanless' ability of looking past all that equestrian "established" ways of teaching and unearthing the real diamond.